From topic discovery to grading, going paperless (aka digital) when you teach the research process is the way to go! I cringe to think of all the wasted paper and index cards that we used during the research process when I was in high school (circa 2000). Not to mention how hard it is to keep track of all those papers. Your students and your back (from carrying all of those papers around) will thank you. After I introduce the theme for the paper, I give students a chance to explore the theme, and I call this day, Discovery Day. Discovery Day is step one in the research process and it is very important because it gives students autonomy in the writing process. It also helps students find a topic that they know will be supportable. I create a discussion question in Google Classroom asking the students to submit their three topic ideas. This format works well because it gives students the opportunity to see their classmates’ topics as well without giving them power to edit their classmates’ responses. Once students submit their topics, I give them feedback on their selections. I personally like to meet with them one-on-one, but in the true nature of fully digital, you can write your comments to them in the discussion forum. One of the goals of the research process unit is for students to understand the difference between a credible, reliable source and an unreliable source. This is particularly important in today’s day when fake news flourishes. I use this Media Source Scavenger Hunt as a mini-lesson after Discovery Day for honing in on this topic. Obviously, students can use a search engine like Google to find their information; however, I ask that students use a required amount of scholarly and/or peer reviewed sources in their writing. Google doesn’t cut it. They generally get too many search results and narrowing it down to scholarly sources can be a challenge. Therefore, I introduce The Directory of Open Access Journals and ERIC. Both sources have a number of free scholarly articles. I also encourage students to use Google Scholar. Google Scholar is a specialized search engine that narrows the students’ search results to scholarly journal articles and ebooks. I personally like to use it for their ebook selection. 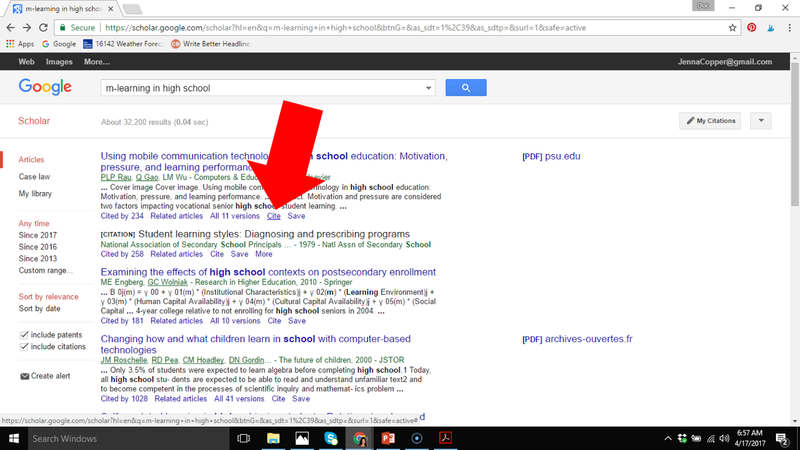 Within Google Scholar, they also can use the “related articles” option to narrow their searches even more closely to their topics. I’ll never forget my moment of sheer panic when my brother spilled orange juice on the table; the table that my senior research paper note cards were spread over. Though I salvaged most of them, I had to rewrite too many note cards for my liking only to eventually type some of them in my paper. When I went to college, I was amazed to find that my professors didn’t require or even advocate handwritten notes for the research process. Cue digital note taking! For me, the note taking aspect of the research process requires several steps, most importantly defining the thesis statement and main points of the paper, so I use this as a guide for my high school students. For middle level student, check this out. Students should have both focus and structure for their note taking so they know what type of information to look for and record. We always begin by defining the thesis statement and main points of the paper, so that the students note taking is driven by their main points. 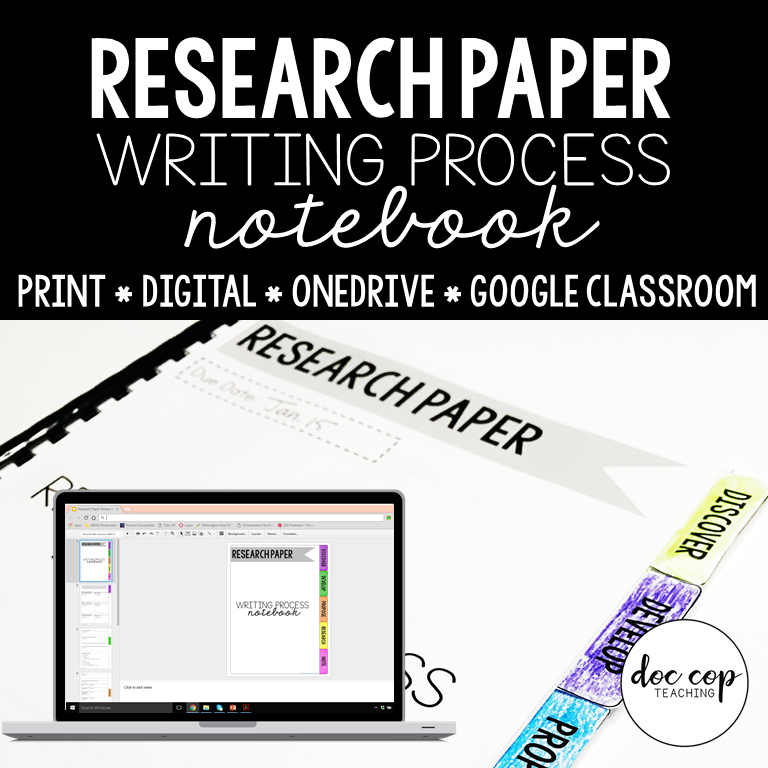 I use this digital research process notebook to guide students to efficient and productive notes. I’ve found that this structure ultimately leads to a well-organized and supported paper. Digital Doc: For this format, students write their notes in a document organized by topic or source. They can cut and paste to group the notes however they choose. Source Grid: A source grid is a chart that organizes notes into topics across the top of a chart and sources down the side of the chart. Sketch Notes: Sketch notes are visual note taking. My friend, Danielle, from StudyAllKnight has a great post on using Google Classroom in combination with the Noteability app for visual note taking. Documentation is a piece of cake with digital research process. There are several reliable bibliography and citation generators that work well. After trying a few, I like Cite This For Me for our purposes because it has both MLA and APA references, and it saves the students bibliographies for one week without an account. It also has a helpful Chrome Extension for citing webpages. For scholarly sources, students usually can find a bibliography for that source in the database or search engine. Note: I always begin with a caution that students must double check their formatting with the associated style (I use APA and MLA depending on the assignment). Too often they get into the habit of copying and pasting whatever the citation generator throws at them even if it’s totally incorrect. I tell them that the citation generator is there to help you, but they must determine if it gave them correct information. For cross checking their citation format, we use Purdue Owl. The purpose of having them work in this document is that it is already shared with me, and I can monitor their work in real time. If I give them class time to work on their projects, I have a record of everything they wrote during the period by looking at their document and viewing the revision history. 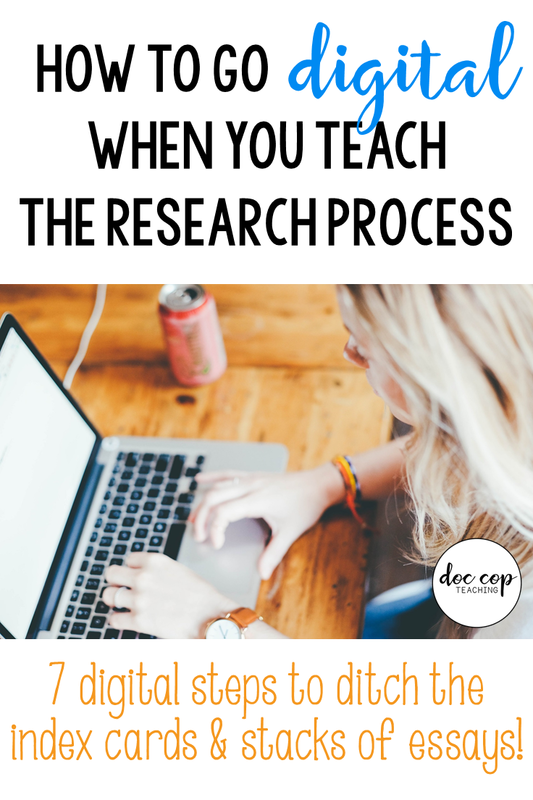 Once students have written their papers in Google Docs, of course, we go through a two-step editing as step six in the research process: peer editing and polishing. On peer editing day, I have students share their papers with two classmates. They read each other’s papers and provide feedback using the comment button in Google Docs. I’ve tried different apps and extensions, but I’ve always come back to this process for its effectiveness and simplicity. I always give them guidelines for their feedback so they don’t simply write, “good.” As an example, I might give them five areas of focus: thesis effectiveness, organization effectiveness, word choice suggestions, one positive summary statement, and one summary suggestion for the paper as a whole. When students receive their papers with comments from two reviewers, they use the “resolve” option to clean up their papers and the comments. This deletes the comment, but a record of the comment is saved in the comment button at the top. This is important if you want to give credit for peer editing. To prepare students for college-level and real-world research processes, I find that giving them the opportunity to check their own papers for “matches” is a meaningful way to teach about avoiding plagiarism. I use the word match because that is what a plagiarism checker provides, a match to another source. A program or website cannot determine plagiarism; only a person can determine if the match was plagiarism, either intentional or unintentional. It is the student’s task to review each match. Sometimes, the match is simply common knowledge that happens to be stated in a similar way. For example, there are only so many ways to say, “Edgar Allan Poe was born in Boston, Massachusetts.” Even though the student would probably find many direct matches to it, it isn’t plagiarism. Maybe the student has an error in their citation punctuation; this could cause the plagiarism checker to find the match. Maybe the student simply forgot a citation. In this case, they fix it and move along. However, what would happen if you didn’t give this lesson? Now, you, as the teacher, have quite the conundrum. How do you know if it was unintentional? Does your school have a zero tolerance policy? Will this student fail the paper? Ugh! Save yourself the agony and give them the chance to revise their mistakes before it’s too late! If after you give this opportunity and knowledge they still have an issue, you can feel much better knowing how to proceed. There are many free plagiarism checkers, and they work similarly. My technology coach and I have searched so many free plagiarism checkers, and we’ve determined QueText to be best for our needs. If you have any other suggestions, please let us know by leaving a comment below. After you’ve done ALL of this work to prevent students from printing mounds of paper, do not print their papers for grading! Resist! You can provide rich, meaningful feedback digitally and save time and trees in the process. You can teach the research process from start (Discovery Day) to finish (grading) without printing a single paper! Of course, you can use the comments and editing guide like the peer review format, but I have many digital paper grading hacks that I can’t wait to share in my next post. Check back for that post! free punctuation checker is so simple to use that you will wonder why you have not used it before. Awesome i really like this unique topic i think meantime digital thinking is necessary in education and good define automatically citation some students don't know this process. In this process we free our work for plagiarism. Cite using generator is the best process for cite your sources. I found one generator on internet they have 20 different citation style like AMA, Chicago, MLA and apa style citation etc. Don't cite your sources manually because we can't remember 100's of style.